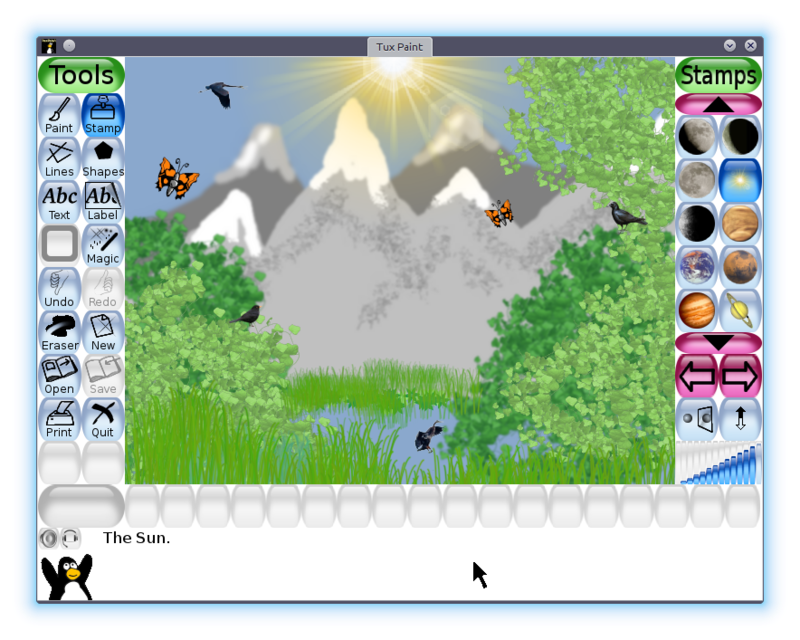 (Davis, CA, USA — August 23, 2014) The Tux Paint development team is proud to announce Tux Paint 0.9.22, the newest version of the award-winning and completely free drawing program for children. Thanks to the efforts of nearly 170 contributors worldwide, Tux Paint 0.9.22 offers 14 new magic tools, 40 new template pictures, nearly 200 new stamps, support for SVG and KidPix templates, and an enhanced text tool. It also features accessibility improvements, including keyboard and joystick pointer controls, and an on-screen keyboard. Tux Paint has always benefited from localization support by volunteers from around the world. Version 0.9.22 is no exception, incorporating translations to 32 new languages: six from Europe (Aragones, Bosnian, Luxembourgish, Serbian, Valencian, and Venetian), over a dozen from the Indian continent (Assamese, Kannada, Konkani, Maithili, Malayalam, Manipuri, Marathi, Nepali, Odia, Punjabi, Sanskrit, Santali, and Sinhala), nine from Africa (Acholi, Akan, Amharic, Bambara, Fula, Kiga, Luganda, Northern Sotho, Sudanese, and Zulu), as well as Armenian, Persian, Sundanese, and the Canadian Inuit language of Inuktitut. Updates were also made to the 90 languages Tux Paint already supported. Tux Paint is available for download free of charge from the project's website at www.tuxpaint.org. Version 0.9.22 is currently available for Microsoft Windows, Red Hat Linux, Fedora Linux, and as source code. Updates for Apple Mac OS X, Debian Linux, and Ubuntu are in development. For a complete list of changes, see the Tux Paint change log, Tux Paint Config. change log, and Tux Paint Stamps change log. For further information, visit www.tuxpaint.org. To learn how to contribute to the Tux Paint project, visit: www.tuxpaint.org/help. Trademark Notices: Linux is a registered trademark of Linus Torvalds. Apple and Mac OS X are trademarks of Apple Computer, Inc. Microsoft and Windows are trademarks of Microsoft Corp. Red Hat is a trademark of Red Hat, Inc. KidPix is a registered trademark of The Software MacKiev Company. Press Release by: Bill Kendrick, Melissa Hardenbrook, and Larry Cafiero.